Congratulations on purchasing your Functionally Fluent! Spanish Course! ​Each Functionally Fluent! Spanish course is divided into 10 units. Each unit teaches you to do 5 things in Spanish. ​Intro Videos - A greeting from the course creator, tips on how to best use this course, and a preview of each unit. Course Lesson Slideshow - The "meat" of the course! Each unit includes colorful pages with fun activities, where you'll do things in Spanish, and become "functionally fluent!" You'll learn vocabulary, grammar, and useful language, in a way that feels fun and functional. There are photos, cartoons, charts, quizzes, interactive exercises. At the end of each unit, you'll "check your progress", and prove to yourself how much you've learned! "Reward Yourself" and "Additional Practice" Videos - At the end of each unit, take a moment to celebrate your progress, and practice Spanish in real life! Follow along with lessons, to hear correct pronunciation. Listen to audio after your lesson, as a review. Listen again later, from your car, at work, or at home! Final Functions Progress Check - Recap everything you've learned to do! Vocab "Cheat Sheet" - Review vocabulary categories, to help you speak about important topics in your life. About the Author - Functionally Fluent! 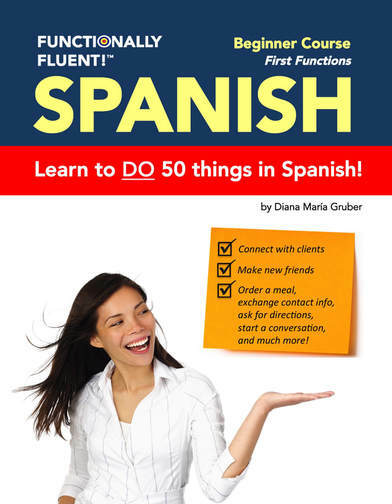 's creator Diana Maria Gruber speaks six languages fluently, and she'll help you learn this one... and more! Functionally Fluent! 's course creator, Diana Maria Gruber, welcomes you to the course! 1) Set aside time for learning Spanish, and set ambitious yet realistic goals. Most students spend 20-30 minutes per page, or 3-4 hours per unit. The entire level can be completed in 30 hours (about 2 months at 3-4 hours per week), but feel free to go slower, since the longer you spend, the more you'll retain. Learning a language requires repetition, patience, and practice, so you need to do more than just "skim" through lessons. You'll want to read, listen to, memorize, practice, and review each element on each page thoroughly before proceeding to the next. 2) Practice speaking Spanish in real life! To learn to speak a language, you need to... well, speak! Use this course to actually practice speaking Spanish with people in your life. While you can do most activities on your own, we strongly recommend you practice the speaking exercises in the blue "Practica" boxes with a real person. ​Ask a Spanish-speaking friend, family member, teacher or tutor to practice a few minutes a day. Or, grab a buddy and learn together! The important thing is to have real conversations, rather than just "listen and repeat." 3) Make good use of of your Functionally Fluent! course components. download the components below, before getting started on the lessons. Download audio to listen to lessons as you view them. Download Audio - UNIT 2 - BEGINNER SPANISH - FUNCTIONALLY FLUENT! Download Audio - UNIT 4 - BEGINNER SPANISH - FUNCTIONALLY FLUENT! Download Audio - UNIT 7 - BEGINNER SPANISH - FUNCTIONALLY FLUENT!